An independent panel of experts will take a look at how U.S. regulators certify airplanes are safe to fly after two deadly crashes of Boeing 737-Max 8 jets. The U.S. Department of Transportation announced the formation of what it calls the Special Committee of Review. "Safety is the number one priority of the department and this review by leading outside experts will help determine if improvements can be made to the FAA certification process," Transportation Secretary Elaine Chao said Monday. Retired U.S. Air Force General Darren McDew and former president of the Airline Pilots Association, Captain Lee Moak, will be interim leaders of the panel until it can be filled with "a diverse group of stakeholders in the aviation industry." FILE - Rescuers work at the scene of an Ethiopian Airlines flight crash near Bishoftu, or Debre Zeit, south of Addis Ababa, Ethiopia, March 11, 2019. Reports last week said the FBI has joined a criminal investigation into the process that certifies passenger jets are safe. Questions have been raised in Washington about the alleged close ties between Boeing — the world's largest aircraft builder — and the Federal Aviation Administration. The FAA sent out a statement Monday asserting that it has "never allowed companies to police themselves or self-certify their aircraft." 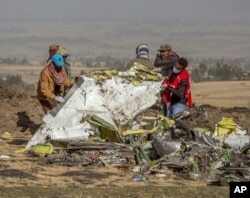 A crash of a Boeing 737-Max 8 off Indonesia in October and the crash of another Max 8 in Ethiopia two weeks ago killed 346 people. Investigators say they see similarities in both disasters. They suspect a maneuvering system that pushes the nose of the plane down to prevent a midair stall may have contributed to the crashes. Boeing has started working on new software to fix the problem. Meanwhile, airlines around the world have grounded the Max 8 at least until the investigations into both crashes are complete. Boeing plans to brief about 200 pilots, technicians, and federal regulators Wednesday on what it is doing to make the Max 8 airworthy again.